The small motorboat rocked gently on the morning waves. No time for breakfast or coffee, my 19-year-old Maldivian guide had ushered me out of bed, to the boat, where his teenage companion was waiting. He saw us, and immediately began to coax the salty engine to life. “We must beat the tourist dive boats,” my guide explained. All I had was my mask and GoPro camera. 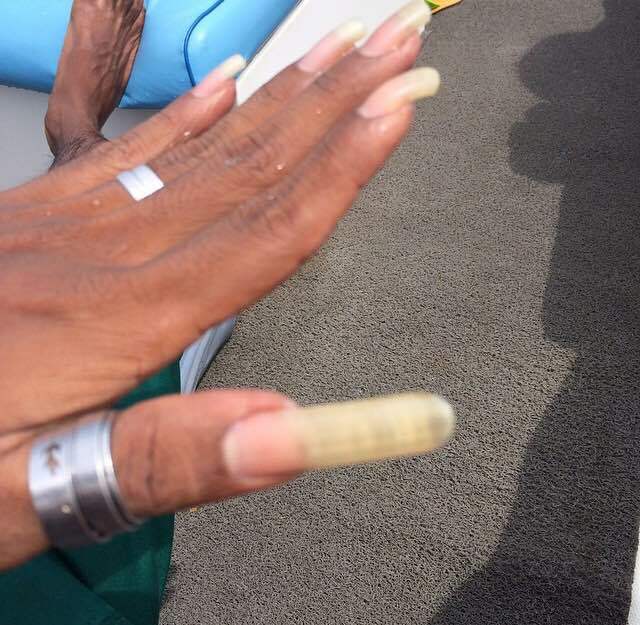 All he had was a never-ending cigarette, hash oil eyes and an impressive pinky fingernail. I had been staring, wondering, and had finally worked up the courage to ask. “How long has this contest been going on for?” I asked. It was my second day on Maafushi Island in the Maldives and the three of us were off on an oceanic adventure to free dive the surrounding coral reefs. Since I was way far off from being able to afford the luxurious dive trips most other Maldives visitors book, I had discovered a much cheaper and one-of-a-kind option: hanging with the young locals. Maafushi slowly disappeared and we became engulfed by turquoise and sapphire. Now, I’ve grown up on the Atlantic Ocean, lived on a beach my entire life- but there’s something different about the Indian Ocean. Something wild and savage, yet too beautiful to be frightened of it. A true siren luring salt lovers into the abyss. And then, I spotted them- there had to be around a hundred. Wild dolphins splicing through the gentle chop, one twisting gracefully in the morning air, another spluttering a stream of foamy liquid from its blowhole. I had seen wild dolphins before, but never like this. Never this many. The boat engine died and we came to an abrupt stop. Waves pulled and pushed the briny hull in a hypnotizing tug-of-war. And the pod surrounded us, passing us, fins rising and falling smoothly with the moving currents. Before I knew what I was doing, my mask was on and I felt my body slipping into the open sea. I held my breath and dove and the Indian Ocean swallowed me whole. The world underneath the waves was intoxicating, a subliminal trip. Plummeting depths with no sand in sight, I floated deep, suspended in hazy green and blue. Streams of sunlight shot here and there, illuminating plankton, and the underwater world was filled with the loud clicks and clacks of dolphin echolocation. For a brief moment, I became a part of the pod.The dolphins swam about me, at a distance, flipping easily onto their sides for a curious glance of this alien creature. They were cautious, but not afraid, toothy, playful grins as they took me in, laughed at me, then continued on their journey. A magical, mystical tropical paradise exists. It is called: The Maldives. This clustered island nation dotting the Indian Ocean like a string of jewels are a well known honeymoon destination, sprinkled with a myriad of luxury resorts. It most certainly doesn’t hold the budget backpacker reputation, but that is beginning to change. Despite the illusion that traveling to this tropical playground is only for the flashy, it is possible to travel on a budget. Yes, you heard correctly- IT IS POSSIBLE. Read my tips on backpacking the Maldives on a budget, and get ready to book your ticket and dive right into a melting pot of culture, untouched salty bliss and unique island living that you won’t find anywhere else in the world. The Maldives isn’t as budget friendly as other countries in Southeast Asia, but if you have the chance to go- take it. Cut down on costs by limiting your time here, and brainstorm what exactly you would like to do. The Maldives offer excellent diving and snorkel opportunities. If you just want to veg out on a peaceful, powder white beach, you can find it anywhere. Research the islands, as each is unique in its own way, some more deserted than others. Also, get a geographic idea of how far each island is from the capital, Male. This is important because the main ferry port is located here- the heart of your Maldives transportation. For location and money, I would recommend checking out Maafushi as a strategic home base. It is the second largest island in the Maldives, has more guesthouse options than the other islands and is a short ferry ride from Male. Maafushi is an easy island to get lost on, and when you stay in a guesthouse, you get to experience the day to day life of the Maldivian people, an experience that gets shut out by staying at a resort. From Maafushi, it’s easy to book dive trips to nearby coral reefs or hang out at the pristine beaches. 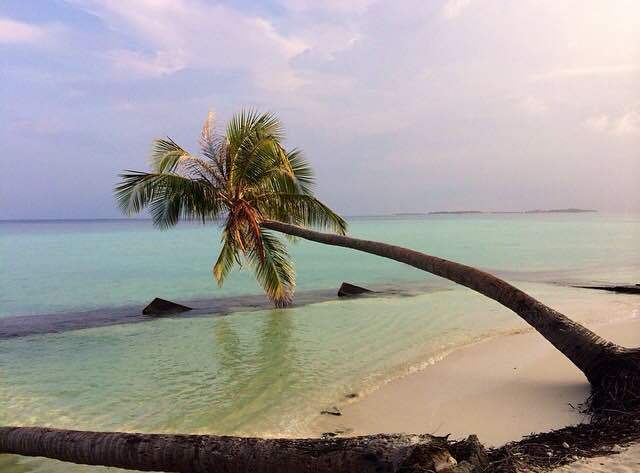 Though Maafushi is the second largest island, there are no paved roads or cars here, just pure white sand, palm trees and warm crystal water. Because the Maldives are strictly Muslim, be considerate about bathing in the sea. On Maafushi, there are two beaches: a local beach and a foreigner beach. It is expected that ladies do not romp around the island or hang at the local beach in a bikini. At the foreigner beach, this is ok.
Hidden in the shadows of those wealthy beach resorts are guesthouses that are much cheaper and offer a one-on-one cultural experience. As budget travelers take the leap and head to the Maldives, more and more guesthouses are springing up out of the sand like coconut palms. 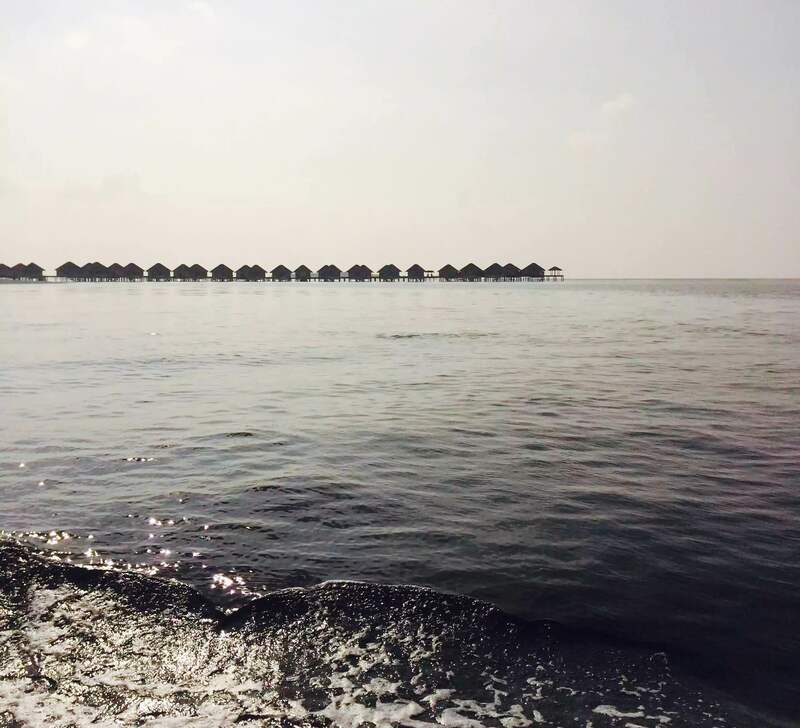 Check out Airbnb for various guesthouses in the Maldives, and you will be pleasantly surprised by the numerous options- way cheaper than those pocket draining resorts. I stayed at the Silver Sea Inn on Maafushi in Nov. 2014, with low rates starting around $20. Prices can vary depending on when/where you go. It was quiet, clean and the staff were incredibly hospitable. The owner invited me to enjoy a traditional Maldivian dinner of savory fish stew and rice with him and his wife on my final night. It was the perfect end to my Maldivian journey, plopping chunks of thick fish caught just offshore into my mouth using my hands. To keep spending to a minimum, embrace the public ferry and walking about the islands. Male, though busy and filled with cabs, is small enough to navigate by foot, and you get to experience much more of the bustling city life. If you plan on staying in the capital for a day or two, it’s easy to find cheap lodging- but don’t expect 5 Star accommodations or beach paradise. All travelers are brought to Male from the airport, because that is where the main ferry port is located. The ferry is the cheapest mode of transport to the islands. You travel with the local people, so the experience is not one to be missed. Speed boats are also available, but are expensive- easily over $100 for a ride. If you have a group, then the price can be split and you can maximize your time with a quick trip, but you won’t get the same cultural experience as riding the ferry. Island transport is by foot or bike. Once the ferry unloads, you will be surprised to look clear across to the other side of the island, no paved roads to be seen. Get lost and explore on your own two feet! This is the best way to observe the unique Islamic island life mixed with cultures from the Middle East, India and Sri Lanka. Check out the ferry schedule to get an idea of routes and prices. Keep in mind that the ferry does not operate on Friday for prayers. Great post. Will include it on my list. The place sounds wonderful. Thanks! Nice, fantastic Maldives and excellent article ! We also went to Maldives on a budget last year … With 4 friends we chartered our own private traditional vessel for a cruise . We booked through a local travel agency (www.cruise-maldives.com) , and we paid 149 $/person per night… It might seem a bit expensive but when you think about it is really cheap as everything was included and we didn’t have to spend for any extras ( except alcoholic drinks and souvenirs). Boat was exclusively chartered for the 4 of us , we had our own private cabin as we are singles and were alone on board. Meals , excursions, equipment, water… all included . It was such a wonderful trip, we saw so much of Maldives, the local island, uninhabited island, sandbank, virgins snorkeling spots, amazing reef and lagoons… It was just like a dream , will definitely go back one day !